Bangkok: Australian man Antonio Bagnato has been found guilty and sentenced to death by a Thai court for his role in the 2015 abduction and murder of Hells Angels gang member Wayne Schneider. Antonio Bagnato, 28, was charged over the abduction and killing of Schneider, a former Hells Angel bikie, at a villa complex in the seaside resort of Pattaya, 150 kilometres from Bangkok, in 2015. He and 22-year-old American Tyler Gerard were arrested soon after the murder. Bagnato was detained in a hotel in Phnom Penh while Gerard was arrested as he attempted to cross the Thai border into Cambodia. Schneider's naked body was found days later in a shallow grave about 30 kilometres from the luxury villa where the initial assault occurred. At a court appearance in November, Bagnato was identified by two witnesses as being present at the scene of Schneider's abduction when he was bundled into a utility. A GPS indicator fitted to the rental helped police locate the body. 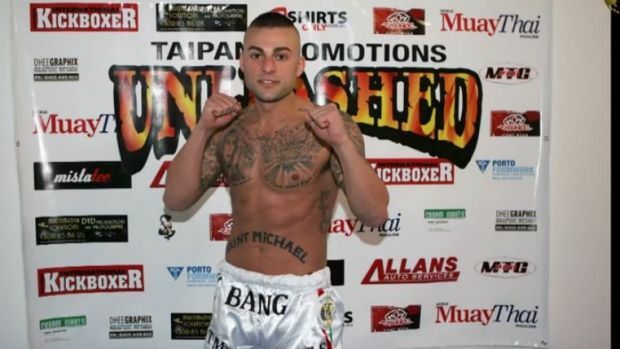 Bagnato and Schneider had been partners in a boxing gym in Sydney and were facing Australian police investigations linked to international drug deals and a separate murder in Australia. Court reports said Schneider's death was linked to conflicts over drug deals. Bagnato claimed that on the night of the assault he had already left the villa to visit a local disco. He said he stayed until 5am and then slept at a woman's apartment until noon. Australian man Luke Hunt has already been convicted by a Pattaya Court of aiding and abetting Bagnato by driving him and his family to the Cambodian border. Hunt was sentenced to three months jail, suspended for two years after pleading guilty. Tony Bang - Antonio Bagnato - also known as "Tony Bang" - when he fought muay thai in Sydney's south in 2012. Last edited by Hatari; 7th February 2017 at 16:01. Sounds like a real "winner"
Sometimes these jokers are not as smart as they think they are. If he actually gets exterminated, like most rats should be, then it will be no loss to society. More likely commuted to life sentence. I agree with you. I don't think Thailand has executed anyone for a long time. He was already wanted for murder in Oz ... so they have saved us the cost of a trial here. "The first defendant [Bagnato] is found guilty of all charges and according to the criminal code, the penalty is execution for the murder and deprivation of liberty, plus a year in prison for hiding the body," Judge Sirichai Polkarn at the Pattaya Provincial Court said. Quarky, Gazmac, kaptainrob and 1 others like this. Remember Thaksin's war on drugs? After a person has been sentenced to death, he is transferred to Bang Kwang Central Prison in Nonthaburi Province, just to the north of Bangkok. This is the only place in Thailand with a Death Row and an execution chamber. Sentences are not carried out straight away as the inmates can appeal at two more courts. These are the Court of Appeal and the Supreme Court. It is quite possible that the courts will commute a death sentence to a life sentence. If they don’t, the inmate still has one last chance. He can apply for a King’s Pardon to reduce his sentence to life. The cells on Death Row measure 4 by 7.5 meters. The walls are 4 meters high. At the top there is a 20cm gap for ventilation. This is blocked by bars. Each cell is built for 18 prisoners, sleeping in two rows. But due to the crackdown on the drug trade, cells these days have at least 24-25 inmates. They each have a thin mattress measuring 50-70 cms by 170 cms. Their belongings are kept in bags and hung on the walls. Each cell has ceiling fans, a TV, and a toilet. Death Row inmates are let out of their cells at 8 a.m. They have two hours to eat and exercise before they are locked back in at 10 a.m. They are again let out at noon to eat, exercise and to bathe. They are locked up again at 2:30 p.m. where they remain until 8 a.m. the following morning. The lights are kept on all night. They also have to wear shackles all the time until the time they are executed or their sentence is commuted to life. A total of 325 inmates have been executed at Bang Kwang. Most of these were executed by machine gun. The last execution of this type took place on 11 December 2002. This was then changed to lethal injection. Four inmates were executed by this method on 12 December 2003. Six years later, on 24 August 2009, two more inmates were executed. There hasn’t been any executions since. After a person has been sentenced to death, he is transferred to Bang Kwang Central Prison in Nonthaburi Province, just to the north of Bangkok. This is the only place in Thailand with a Death Row and an execution chamber. Sentences are not carried out straight away as the inmates can appeal at two more courts. These are the Court of Appeal and the Supreme Court. It is quite possible that the courts will commute a death sentence to a life sentence. If they don&rsquo;t, the inmate still has one last chance. He can apply for a King&rsquo;s Pardon to reduce his sentence to life. A total of 325 inmates have been executed at Bang Kwang. Most of these were executed by machine gun. The last execution of this type took place on 11 December 2002. This was then changed to lethal injection. Four inmates were executed by this method on 12 December 2003. Six years later, on 24 August 2009, two more inmates were executed. There hasn&rsquo;t been any executions since. Shivers. I'd take the machine gun over 50 years in that cell anyday. The Aust Gov should send over a pallet of beers to the Firing Squad for taking care of this grub. If he was tried in Aust , the case would have gone on for years and cost millions and then he would have got a suspended sentence because he is " Ethnically Challenged". crispy, Ian Forbes and obes like this. That is the same way Canada handles its criminals. Our streets are crawling with young men who have criminal records as long as your arm, and yet are still breaking into cars and people's homes. Somebody is always making some excuse for their behavior... like it wasn't their fault. I am amazed the Trial went that fast. Usually takes years longer while people rot in jail. Funny how that works, isn't it. Not in the book I read. Something like Welcome to Hell, there are two book with similar titles. It was the 80s, but this guys trial took five years and was a farce. He was framed, sentenced to death, death sentence commuted to life and eventually released 9 years later. His trial took five years. It was a year before he was even seen in court. He related countless tales of the same. He could have walked free if he could have afforded the bribe. And THAT is precisely the point I was making. Bribes at all levels are how things are done in Thailand. If you are wealthy and have local influence, then you can get away with just about anything... for a while... or at least until there is a change in government. ^And there it is. If you know the right people, (Or you are the son of the village headman) they will essentially give you time to get away. It doesn't involve any decision and that means nobody made a mistake or got anything wrong. Afterwards they can pursue you "To the full extent of the law" without any blowback....(Well that's if nobody has "Confessed" to the crime in the interim).